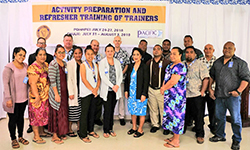 The National Supreme Court of FSM and the Pacific Judicial Strengthening Initiative hosted the Activity Preparation and Refresher Training-of-Trainers Workshop from 23-17 July, 2018, at the Central Facility in Palikir, Pohnpei. The workshop was attended by 18 court staff from Pohnpei, Yap, Chuuk and Kosrae. The faculty included trainers from FSM and Australia. Participants of the workshop received training to develop their confidence in leading, designing, delivering, monitoring and evaluating ongoing judicial and court development activities. The practical and interactive workshop also focused on developing adult learning skills to help the Supreme Court with implementing its newly developed Access to Justice Plan and associated training in each State. The Pohnpei Public Library celebrated the end of this year’s annual Summer Reading Program (SRP) on July 13, 2018. Head Librarian Mr. Lester Ezekias welcomed all in attendance at the closing celebration and thanked participants, volunteers and parents for their contributions and assistance during the four-week program. In line with the theme for this year’s SRP “Libraries Rock,” three health-related children’s songs were performed by the SRP participants. 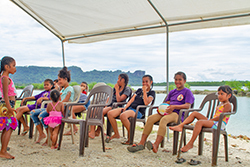 Group 1 which was comprised of K5-2nd graders sang a song entitled “Wash Your Hands”; Group 2 comprised of 3rd-5th graders sang “Suke Laud Kahrehda Ngih Rongala” (too much sugar causes tooth decay); and Group 3 consisted of 6th-8th graders who sang a song entitled “Pohnpei Lingan”. All the songs were taught by Mr. Alanso Jimina, retired Music Specialist for the Pohnpei Department of Education. Washington D.C.-- Yesterday, President Donald J. Trump declared a disaster under the Compact of Free Association between the Government of the United States of America and the Government of the Federated States of Micronesia, as amended, due to severe storms, flooding, and landslides during the period of March 16 to March 17, 2018. The President’s action makes Federal funding available for U.S. Government emergency relief and reconstruction assistance to the Federated States of Micronesia in accordance with Public Law 108-188, as amended, including Article X of the Federal Programs and Services Agreement to the Compact of Free Association. President Peter M. Christian of the Federated States of Micronesia requested a disaster declaration on June 13, 2018. The U.S. Agency for International Development’s Office of Foreign Disaster Assistance will coordinate U.S. Government disaster assistance efforts in conjunction with the Department of Homeland Security, Federal Emergency Management Agency and the Government of the Federated States of Micronesia. 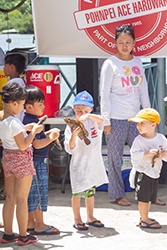 Pohnpei—Ace Hardware sponsored its 4th Annual Ace Hardware Kids’ Fishing Tournament today. 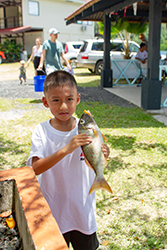 Several children participated in a half day of fishing inside Pohnpei’s lagoon both for fun and for possible prizes. The weigh in was held at noon at the Mangrove Bay Bar and Grill. It’s always a fun event to photograph, and the children have a great time. Ace Hardware sponsored prizes including Ace gift certificates and two new bicycles for big fish, pretty fish, and ugly fish. They also provided free hot dogs for all and gift bags for every child who participated. Winners for the competition for ugliest and prettiest fish were decided by angler response as each fish was held up. Ethan Mamangon won the prize for prettiest fish and Ian Boylan won the prize for ugliest fish. 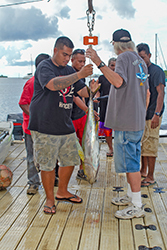 The Pohnpei Fishing Club did not provide the species of fish caught nor the prizes won in the information they gave to The Kaselehlie Press. In the Big Fish category, Melisha Isaac came in fifth place with a 1.9 pound fish. Kristen Henry caught a 2.8 pound fish. Rylan Yinug’s fish was 5.7 pounds. The top two prize winners were Noah Adams with a fish of 7.7 pounds and Connor Boylan whose fish was 8.3 pounds. As close relatives of the sponsors, Boylan and Adams agreed to give up the bicycles their catches had earned them. They conducted a hastily arranged lottery for each of the bicycles, one for a boy and one for a girl. PALIKIR, POHNPEI – The Fifth Special Session of the 20th Congress of the Federated States of Micronesia is scheduled to convene on August 2-7 as called by President Peter M. Christian. 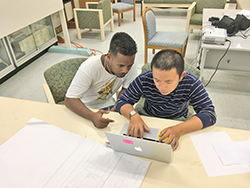 The College of Micronesia is taking innovative measures to ensure student success. This summer, we combined an English course (ESL 089) with the History of Micronesia (SS 150). 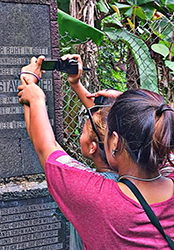 The cross disciplinary course was known as Filming Our Journeys: Connecting Micronesian History to Contemporary Islander Life. Seventeen incoming freshmen enrolled and were taught by the team of Delihna Ehmes and Denise Oen. The first two weeks of the class had a storytelling (via film) for social justice focus. Dan Lin (a well-known photographer and filmmaker) and Canita Rilomento (an experienced community educator) both of the Pacific Resources for Education and Learning organization, designed and implemented this workshop with the assistance of Ehmes and Oen. During these two weeks, the students learned all aspects of filmmaking from: the coming up with the original concept, to script writing, to storyboarding, to direction and filming, and then on to the final editing and eventual screening. Students were very proud of their films and shared their work with their family and friends via social media. They also held a screening for several college administrators: Maria Dison, Karen Simion, and Joseph Felix, Jr. They were so impressed with the students’ work that they requested the films be part of the orientation for new students this fall. 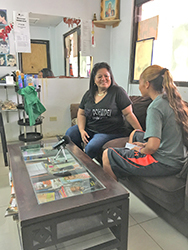 A key aspect of the filmmaking workshop was interviewing community leaders for their insights and guidance on continuing to improve communities in the Federated States of Micronesia. They interviewed: Bethwell Henry, Rufino Mauricio, Jennifer Helieisar, John Haglelgam, Marstella Jack, Bruce Robert, and Delihna Ehmes. The gift of hearing from these leaders was very illuminating across many issues. These interviews were then edited together to make short films. These films will be shared with the larger education community across Pohnpei. After the workshop, the class continued with the cohort configuration of the same students in both classes with two professors. Denise taught ESL 089 and Delihna taught SS 150. They connected their course content through shared class experiences including readings, films, field trips, small group presentations, and discussions. The ESL 089 course content included contemporary islander topics which connected with the content of the History of Micronesia: Cultural Representations of Pacific Islanders. Islander Migration and Immigration, Micronesians in the Military, and Island Economics. We read books about the History of Micronesia, explored articles regarding contemporary island issues, watched films (Island Soldier, Whale Rider, Cannibal Tours, etc. ), participated in role plays about colonialism, went on field trips (Nan Mandal, Sokehs Ridge, Sokehs Island, PMK fish market, and the Bank of the FSM.) We had many class discussions and the students learned that you need to know “why” you think the way you do because Delihna and Denise are going to ask! Students achieved the learning outcomes in both courses and are now adept at strategies and techniques needed for college: analysis and synthesis of information, reading for information strategies, writing thoughtful and reflective essays, and creating presentations for their classmates. 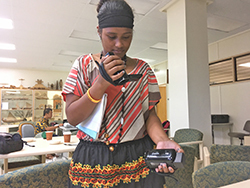 Their knowledge of the History of Micronesia is now substantial and the conversations throughout the summer demonstrated a critical awareness of the complexity of the multiple narratives of what has happened on the islands that they love. Students also figured out how to be a “college student.” They learned how to be responsible for attendance and timeliness, how to work with others, how to speak publicly, and how to navigate the college system as a whole. Another important part of the class was the creation of a “family of learners.” Using the research on Culturally Relevant and Sustaining Pedagogy, we used a “family” approach. We held class in a room which permitted classroom discussions in the round, lots of room for meeting in small groups, and even room to stretch out on the floor to work in close proximity to others. We shared our lunches, fell asleep together on the van on the way back from long field trips, and celebrated birthdays and goodbyes. We laughed and cried together during movies, “argued” during role plays, and cheered our learners on as they continued to accept every challenge we offered them. Success can be measured in a plethora of ways. The course had a 94% completion rate and a 100% passing rate. Clearly this points to an innovation worth continuing. We also asked for student feedback and their thoughts were equally evident that this course is a move in the right direction. I believe this class has connected in the way Micronesians live. …We got used to each other, we grew as one even with our strong diversity. We've come to love in harmony, we're undivided, we're one family, and we’re brothers and sisters. When went on trips, we shared snacks, and we waited for others to catch up on our walk up to Sokhes Ridge. We grew as one and helped one another like a family . I experienced many things in this class and the best is that I got to learn more about Pohnpei’s history. I watched a lot of emotional movies, I got to know many friends in our small group work. I’m was so excited about our trips together and thankful to those guest speakers who put in their time for us. I’m so proud of myself that I can film my own movie or film it with my classmates. Now I have learned how to be a filmmaker, a writer, and an explorer. I’m sure I’m ready to put on my shades and face the fall semester. We are so grateful to have had the opportunity to teach and learn with these young adults this summer and can’t wait to work with them again soon. 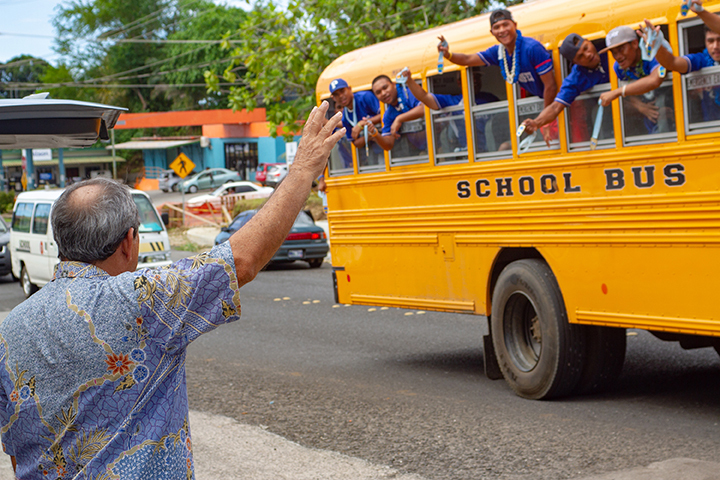 Pohnpei—Pohnpei’s athletes who participated in the Micronesian Games in Yap received heroes’ welcomes as they returned. Hundreds of people carrying banners and cheering wildly welcomed the athletes as they arrived at the airport, and then followed them through town in happy cheering motorcades. After the last of the athletes arrived today, all of the athletes paraded through town to the government complex where the State sponsored a huge party for them. The Pohnpei athletes performed very well at the games. Though in terms of gold medals they came in fourth place with a total of 18, they tied with Palau for first place in terms of total medals earned with 70. 33 of those medals were silver medals and 19 were bronze. Palau won the games with a total of 32 gold medals. The Republic of Marshall Islands was tied with Guam with 29 gold medals each but RMI had 17 silver medals while Guam had 12, putting RMI in second place. CNMI was in fifth place with nine gold medals, followed by Yap with five. Chuuk also earned five gold medals. Kirabati and Nauru each had two gold medals. While Kosrae did not earn any gold medals they did earn a total of 14 medals, four of which were silver. In athletics competitions, Pohnpei’s athletes brought home three gold medals, eight silver medals and seven bronze medals. Pohnpei’s baseballers brought home gold, the first time for a Pohnpei team to medal in a very long time. 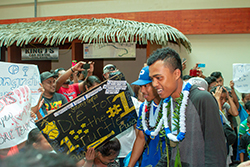 Pohnpei’s basketball team came home with bronze medals. Pohnpei men brought home gold and bronze medals for Micronesian All Around. Pohnpei women brought home gold and silver in the event. Kestra Aileen Kihleng brought home a very respectable bronze medal for the 2.5 km open water swimming event. It was not only Kihleng’s second ever open water swimming event but also only her second long distance swim competition of any kind. She also came in at a respectable fourth place in the 5K open water swim. Defending soccer champions, Pohnpei again brought home the gold. Taylor Paul won a bronze medal for individual spear fishing and Pohnpei’s spearfishing team brought home silver. In table tennis the men’s team brought silver. Men’s doubles also earned silver, and John Thomsin brought bronze in singles. Pohnpei women brought silver in Va’a while the men brought bronze. Pohnpei’s weightlifters and wrestlers brought home an impressive number of medals in a variety of event. Weightlifters brought home four gold medals, 10 silver medals, and two bronze. Wrestlers brought home seven gold medals, 11 silver medals, and three bronze. Complete results for the Micro Games can be found at http://websites.sportstg.com/medal.cgi?mt=28&pID=1 . The next Micro Games will be in RMI in 2022. Yap, FSM—The FSM National Government has arrested 16 Philippine nationals in Colonia, Yap who arrived at that port aboard a tugboat allegedly operated by Fahrenheit Co., Ltd. They have also seized the tugboat and two cargo containers that were aboard the vessels. They are being charged with violations of FSM’s Title 18 for entering the FSM’s EEZ without a permit or clearances and also for immigration violations. A news story by Pacific Island Times says that the tugboat arrived at Yap’s Port of Entry at 11:30 AM on July 30, 2018, without legal documents including Port Clearance, Maritime Declarations of Health, Deratting Certificates or Customs Clearance. That article says that an Environmental Health Services Health Quarantine officer attempted to deny the tugboat “Ocean Support” entry to the port by diverting it to the quarantine buoy near Nungoch Island. But a port agent told EHS that officials from Yap State Department of Resource and Development did not want the tugboat to be moved away from the dock. Another vessel, the “Forever Lucky” owned by Fahrenheit Co., Ltd had been scheduled to arrive in Yap prior to the recently concluded Micronesian Games, but Philippines authorities detained the vessel and arrested its crew for a variety of violations involving documentation. The Yap government had signed an MOU with Fahrenheit to provide lodging aboard the “Forever Lucky” and to provide catering services for the games but due to the arrest in the Philippines, it never arrived. The initial hearing date is set for August 14 at the FSM Supreme Court in Yap. Editor's note: Due to a mechanical failure on a United Airlines flight to Guam, the Supreme Court Justice could not arrive in time for the scheduled preliminary hearing. It has been delayed until August 16. FSM—Last week United States Ambassador Robert Riley to the FSM began a media campaign to inform Chuukese citizens about the facts regarding the possibility of a Compact of Free Association with a nation of Chuuk, should the voters decide to secede in their election eight months from now. As United States Ambassador Extraordinary and Plenipotentiary, Ambassador Riley’s words are fully representative of the government of the United States. In his interview with The Kaselehlie Press, his video message released on YouTube, his radio recordings, and in public forums, the Ambassador gave the very clear message that there have only ever been three Compacts of Free Association with the United States in the world in all of history. There will never be another, even for a new country of Chuuk if that comes to exist. He made it clear that the United States government would never interfere with the right of self-determination for the people of Chuuk. The people of Chuuk have a right to decide. They also have a right to be fully informed before they make their decision at the polls in March 2019. Of course, the relationship with the United States with a potential new nation of Chuuk is only one part of the information that voters need to know about as they consider secession but that is the only part that Ambassador Riley could authoritatively address. As US Ambassador to the FSM, it is his job to share information on US policies with the FSM. “I am not here to tell them how to vote, only to give them the facts so that they can accurately weigh the pros and cons,” Riley wrote after his two public forum meetings in Weno, Chuuk. FSM—At near the halfway point of the 2018 Micro Games in Yap, Guam is the gold medal leader with 26 medals, followed by Palau with 21, Pohnpei with nine, and Yap with 5. Guam athletes have been awarded a total of 50 medals, followed by Pohnpei with 40. Pohnpei has 20 silver medals and 11 bronze. Palau has the third highest number of medals with 36, seven of which are silver and 8 bronze. Home team Yap has won the fourth largest number of medals with 26, 8 of which are silver and 13 bronze. Though the discovery of a highly contagious and debilitating rotavirus was made just before the games began, and logistical problems due to the arrest of the “Forever Lucky” threatened to derail the games, they seem to be running reasonably smoothly. The typically friendly residents of Yap have been reminded to “WAVE”, meaning to “Welcome All Visitors Enthusiastically”. 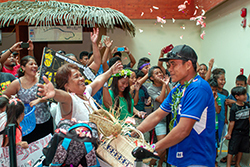 People in Yap don’t really need that kind of reminder but they have shown their hospitality and friendliness by opening their homes to visitors who had no place to go when the “Forever Lucky” failed to arrive as planned. The games began with a spectacular opening ceremony with the entrance of the athletes and speeches followed by a truly stunning fireworks display, the first that many people at the games had ever seen and certainly the first in Yap. Perhaps the darling of the games is Jonah Harris of Nauru. His is truly a Cinderella story. Before the games began Nauru announced that it was pulling out of the games because it couldn’t afford to travel. But it didn’t stop one of their athletes, Jonah Harris from finding his own way to Yap and dominating in every Athletics meet he participated in. 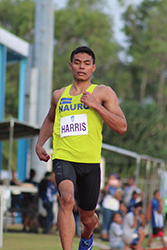 By himself, Harris won two gold medals, two silver and one bronze medal. In the Men’s 100 meter race Harris won a gold medal with a time of 11.07 seconds. He jumped 6.33 meters for a gold medal in the long jump. His time of 22.22 seconds in the 200 meter race earned him a silver medal. His high jump of 1.85 meters earned him another silver medal. His only bronze was in the triple jump with a distance of 12.09 meters. The Micro Games was supposed to have been live streamed on the Micro Games official webpage but they were never able to get that service up and running. 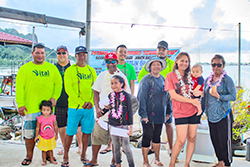 Pohnpei—17 boats registered and participated in the LP Gas – 7 Stars fishing tournament on Saturday, September 7, 2018. The fishing conditions were difficult on the day of the tournament but several anglers still managed to coax some fish out of hiding. We want to thank the sponsors: LP Gas/7 Stars and their related businesses, Lefty’s, 7 Stars Inn and Restaurant, Hot Plate and 7 Stars Store. The format of the tournament was big fish. There were lots of prizes including a $1,000.00 grand prize. All prizes were in cash. No one won the marlin jackpot. It is now $4,300.00 for a marlin over 450 pounds. There was a wide distribution of prizes among the boats. 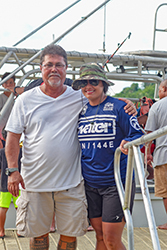 Congratulations to Steincia Hawley for landing the biggest fish of the day and winning the $1,000.00 grand prize. The prizes were distributed in the way they were because each fish could only receive one prize. We also want to thank all the people who helped out: Bill Pendergraft, Tina Albert, Kumer Panuelo’s guys, and everyone on the dock. 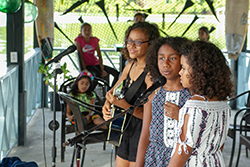 Elementary school aged girls Jasmine and Lia Daunakamakama, and Beulah Tamani sang to their own ukulele and guitar accompaniment with voices well beyond their years and a repertoire to match, stunning all who heard them at the weigh in for the tournament. During breaks, Chris Johnson also spun some great recorded music. 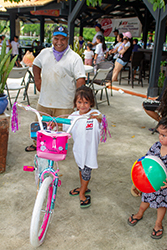 We also had a barbecue to support the Pohnpei Public Library. Once again thanks to our sponsors, LP Gas and 7 Stars. Our next tourney is the annual kid’s tourney, set for July 28 and sponsored by Ace Hardware. Get your kids ready for some fishing action. The National Oceanic Resource Management Authority (NORMA) has been monitoring a steady increase of transshipment and unloading activities in Pohnpei Port for the past 3 months from April-June, 2018. A total volume of 115,093 metric tons of tuna was transshipped for the month of April (26 vessels) May (53 vessels) and June (74 vessels). 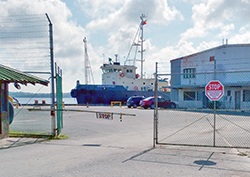 Pohnpei Port has been the main port of transshipment operations for all the four states of the Federated States of Micronesia (FSM) with some unloading activities in Kosrae and Yap. The increased numbers of transshipments are in line with the prevailing ENSO conditions (La Nina-type conditions) in which fishing activities are more concentrated in the western tropical areas. Thus, fishing activities increased in the FSM for the past 3 months. Kolonia Town receives donated emergency vehicles.Kolonia Town receives donated emergency vehicles. The Micronesia Islands Forum Secretariat (MIFS), the coordination body for the Micronesia Islands Forum, is pleased to announce the hiring of the Regional Invasive Species Coordinator, Mr. James Stanford and the opening of the Regional Invasive Species Coordination Office in Koror, Palau. 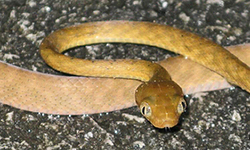 Invasive Alien Species (IAS), sometimes called invasive species or pests, are detrimental species which arrive and establish in places outside of their native range. On Pacific Islands, these unwanted pests can and do cause significant impacts across all sectors and segments of society. We as islanders are all impacted by IAS which can negatively impact human health and quality of life, food security, economics, culture, natural resources including imperiled native species and our ability to address climate change. In 2005, as part of the development of the Micronesia Chief Executives Summits (MCES), the Regional Invasive Species Council (RISC) to the Chief Executives was established. The RISC is composed of up to two delegates from each of the member jurisdictions. The core RISC members include: Palau, Marshall Islands, Guam, Northern Mariana Islands, Federated States of Micronesia National and its four states Chuuk, Kosrae, Pohnpei and Yap. Our colleagues in Hawaii also participate with and support the RISC. In 2015, after several years of extensive effort and through the support of numerous partners including the U.S. Department of Defense (DOD) which provided significant financial backing and the University of Guam which provided a regional nexus for coordination, the U.S. DOD released for the region a Regional Biosecurity Plan for Micronesia and Hawaii or the RBP. The RBP is a one of a kind document providing a regional framework for advancing and strengthening invasive species prevention and management for Micronesia and Hawaii. While the RBP incorporates hundreds of actionable items, one of the top priorities is establishment of a regional invasive species coordination office, to facilitate both local and regional efforts towards invasive species risk and impact reductions. In 2017, the MIF was established as a successor to the MCES and in 2018 the MIFS was established in Palau. And now through the its efforts and the support of many partners, the MIFS has provided for addressing this high priority action from the RBP through the hiring of the first ever Regional Invasive Species Coordinator. The Coordinator, Mr. Stanford has worked in the Pacific Region as an invasive species and biosecurity specialist since 2004 and has a long history of supporting the jurisdictions of Micronesia and working with the RISC. Mr. Stanford arrived in Palau less than a week ago and he is already busy with numerous tasks including getting the office up and running, opening dialogue with the MIF jurisdictions, planning for a review of the RBP and supporting the updating of member sub-sections and priorities, coordinating with a wide array of partners and potential donors and developing grant proposals to support invasive species prevent and management work within the region. Our islands already have many IAS that are established and causing harm. And there are many more pests which have not yet established on various islands, but which are a threat and at risk of establishing. 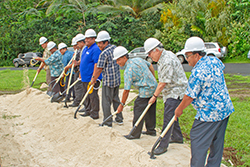 Our roles as citizens of the Pacific is to work together to prevent additional pest incursions and to implement sound management of those which are already established, ultimately reducing risk and impacts, which in turn will promote healthier ecosystems, economies and communities, improving our lives and strengthening our communities and islands. In parting, James would like to express that establishment of a regional coordination office is an excellent step, but as important as coordination is, ultimately securing our islands from pests, termed “biosecurity”, involves everyone, residents and visitors. 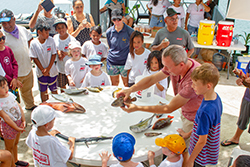 James relayed that “we are all biosecurity officers and we all need to do our part in protecting our islands, our homes from invasive species”. 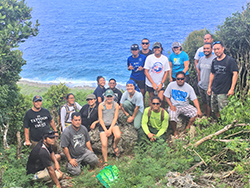 Participants and instructors of the “Tropical Forest Ecology” course pose for a photo on the East Coast of Guam. 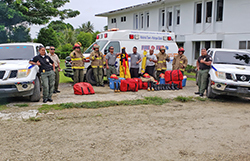 The 17-day course was offered by the University of Guam in partnership with Iowa State University and the U.S. Forest Service from May 21 to June 7. 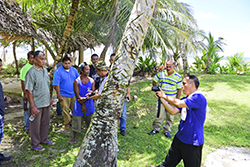 Forestry workers from around Micronesia have returned to their home islands with newfound knowledge and a fresh perspective on conservation following an intensive 17-day course offered by the University of Guam (UOG) in partnership with Iowa State University and the U.S. Forest Service. Professors from both universities led 15 participants in a “Tropical Forest Ecology” course from May 21 to June 7. Miller headed the course along with Haldre Rogers, an Assistant Professor in the Department of Ecology, Evolution, and Organismal Biology at Iowa State University. The bird-less forests of Guam inspired Rogers’s research and Ph.D. thesis focusing on the wide-ranging effects of bird loss on the forests where they disappeared. The intensive course took students on a comparative journey through the forests of Saipan and Guam. Participants worked in groups to develop a hypothesis and then headed into the field to collect data. Evan Fricke, a post-doctoral researcher from Rogers’s lab, worked with the group on Saipan, and Ann Marie Gawel, a doctoral candidate in Rogers’s lab, assisted on Guam. The comparison of forests in Guam and Saipan proved impactful for the students. 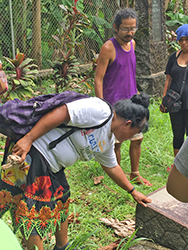 “To see the fragmentation and loss of forests on Guam is very alarming,” said Wendolin Roseo Marquez, a participant from Pohnpei who works as a Senior Grants Officer with the Micronesian Conservation Trust. Levani Shiro, a student at Northern Marianas College, said she was also greatly surprised by the enormous impact invasive species have had on the ecosystems of Guam. “It was strange being in the field in Guam and not seeing or hearing any birds. It also seemed like there were many more mosquitoes than in the forests of Saipan,” Shiro said. The students were eager to return to their home islands to apply what they had learned. Valentino Orhaitil, a course participant from the Department of Forestry in Yap, said he felt the class was very important for natural resource managers and that it increased his knowledge base of relevant information that he plans to apply in the forests of Yap. Marquez said he hopes to bring the course to Pohnpei in the near future to help build the capacity of terrestrial resource leaders and managers. Rogers looks forward to the growth in exploration and research that this course may have inspired. “What excites me about this course is that it allows students to participate in novel research projects that then generate more questions for future exploration,” Rogers said. I present my warm greetings to the people of Chuuk, both at home and afar. Chuuk is presently mooring at port bent on launching a voyage to secede from the Federated States of Micronesia. Without alternate Compact-like partnership and unique arrangement for comprehensive cooperation, this secession movement could sail us headlong into an ocean of great turbulence and enormous hardship, raising the credibility of the future government of Chuuk. I refer here to the idea of: (1) severing of our friendship and leaving the Federated States of Micronesia, and (2) destabilizing the harmony and partnership with the people of the United States of America. After all, this is what, in my view, Secession boils down to – a voyage of self-destruction for ourselves, the people of Chuuk. For years, I have labored intensely to avert this voyage of self-destruction. Even after leaving office, the interests and welfare of the people of Chuuk – our children and the children of their children – continue to be uppermost on my mind and deep in my heart. I must not give up on them. I have said what I had to say about this menace in our midst called Secession. It is not my intention to hurt the feelings of those holding views contrary to mine and like-minded Chuukese. My ultimate obligation is our children – not to leave behind for them a world of misfortune. It is definitely not a legacy that my family and I wish to leave behind. The United States Government in the person of its resident Ambassador, Robert Riley, has just released a videoed statement. The purpose of the Ambassador’s statement is to clarify the position of the US in regard to the Compact, and that is not to interfere in the internal political processes of Chuuk but to clarify US position in relation to the Compact of Free Association. Chuuk’s desire is to secede from the federation and to enter into a new Compact with the US. The US does not wish to establish a different Compact with Chuuk. The Compact is purposefully designed to maintain a special relationship between the US and the FSM and the US, inclusive of Chuuk. The FSM and the US do have comprehensive and unique relationship, as Ambassador Riley pointed out in his videoed statement, in his meetings with Chuuk Leaders and the general public. The Ambassador’s videoed remarks, including his subsequent “town hall meeting comments at Chuuk High School on 18 July were not just chitchat, but based on US policy position. Most likely they are a concerted production involving the State Department, the Department of Interior, the Pentagon and the Pacific Command, among others. To me, whether one is in favor or is opposed to the Chuuk’s Secessionist Movement, we should await to cast our votes on the question in January, or March 2019 in accordance with set legal process. The voters of Chuuk must make an informed choice and clarification must be made about the “permanency” of such choice. 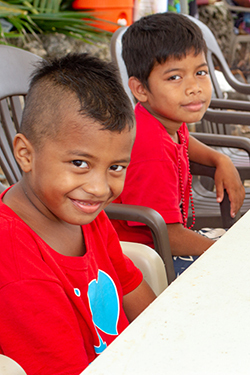 Under the immigration provisions of the Compact between the US and the FSM, the FSM citizens, including those from Chuuk, are free to reside, go to school, and work in the US. Once the desire to secede prevails at the polls, the validity of the FSM passports held by the Chuukese people ceases. This means that the approximately 30,000 Chuukese in the US and in the American Armed Forces, will be deported from the US. What shall we do for our people left stranded in the US? In light of the reiteration by the US Government, the Compact is between the US and the FSM, inclusive of all the four states. Chuuk’s withdrawal from the Cmpact is tantamount to forfeiting its eligibility for Compact sectoral grant assistance. Does the Republic of Chuuk or any other country, other than the US, have the absorptive capacity to make up for the gigantic loss of assistance? I have spoken long and hard about this plaque. Getting out of the Compact and leaving the FSM are a suicidal act of juvenile impulsivity! The US federal programs and technical assistance schemes extended to the FSM are an immense support to all, including Chuuk. Will the Chuuk Republic have the wherewithal to provide assistance to families in times of natural disaster, for instance? Will Chuuk have the means to buy out the FSM Government from the College of Micronesia or the FSM Telecom? The FSM Compact Trust Fund was intended as a “safety net” once the well of annual grant assistance was dried up. By seceding, Chuuk has forfeited itself from this possible source of support. While the center of emphasis and technologies of national defense and security may shift from time to time, the imperative simply does not disappear in the middle of a sound moon-lit night. At least some semblance of it must be preserved. Will the Republic of Chuuk continue to remain under the American defense umbrella? Inasmuch as we do not wish to ask, we must ask: if it seems that its security is at stake, will the US simply stand up and leave? I appeal to you again, my fellow Chuukese, to put aside your partisan politics and to put above everything else the welfare of our children and future generations. I also call upon the leaders of Chuuk to avert us from this voyage of self-destruction and steer us back to our Promised Land. The Amended FSM-US Compact of Free Association is supposed to be built on mutual respect for the sovereignty of the compacting parties. The Amended Compact was signed on the ambassadorial level between the two nations. NOWHERE in the Compact does it allow the ambassador of either county to go into the other country to directly and personally participate in the local political process to influence the outcome of a local election or plebiscite. The current US Ambassador to the FSM, HE Ambassador Riley, has recently distributed a video program in which he personally talks about the Chuuk Independence Movement, discouraging the Chuukese voters from supporting Chuuk's Independence Movement and stating that the United States may not be willing to enter into a separate Compact of Free Association with an Independent Chuuk Nation. Admittedly, a separate Compact with the US is one stated goal of the Chuuk Independence Movement, primarily to secure the privilege of the Chuukese/FSM citizens currently residing in the US jurisdictions by virtue of the existing Amended Compact. Ambassador Riley is now distributing his political video to the Chuukese internet audience and is scheduled to hold a meeting on July 18 at the Chuuk High School with interested Chuukese voters. Ambassador Riley claims his program is some sort of public service education program to share pertinent information with the Chuukese voters on their Independence Movement. Apparently, the Ambassador believes the Chuuk State Government must have made an ill-informed decision in creating the Chuuk State Political Status Commission and its subsequent endorsement of the Commission's recommendation for Chuuk State to pursue political independence from the FSM consequent to the difficult experience within the FSM constitutional federation and to the scheduled termination of US Compact financial assistance in 2023. The Ambassador uses the threat of likely interruption of Compact assistance to the Chuukese people, including interruption or termination of the privilege for citizens to live and work in the US a reason for the Chuukese people not to support their state's official decision to pursue Independence from the FSM. OBVIOUSLY THE US AMBASSADOR'S ACTION IS CALCULATED OR INTENDED TO INFLUENCE THE CHUUKESE VOTERS' INCLINATIONS OR VIEWS BEFORE THE SCHEDULED PLEBISCITE IN MARCH, 2019. The American Government, of which Ambassador Riley is the official personification in the FSM, calls the alleged Russian meddling in the recent US presidential election "a violation of American democratic sovereignty." They even hire a former FBI Director as special prosecutor and spend millions of dollars investigating the allegations. The entire world community agrees with the American indignant reaction. Even the Russians themselves deny the accusation, thereby admitting to the international norm against meddling in a sovereign nation's local political process. What then, are we to make of the US Ambassador's action in conducting his own public campaign for the purpose of discouraging the Chuukese people from supporting their freely elected state government's official program to pursue separation from the FSM?? The Ambassador in his video remarks, does not even try to understand the underlying reasons for the Chuuk State Independence Movement. He simply claims that the current Compact arrangement between his country and the FSM or Micronesian entities is the best sort of arrangement there can ever be considering all the historical, social, economic and security circumstances surrounding the special relationship between the United States and the former Trust Territory or Micronesian islands. It probably is not very nice to confront the US Ambassador with the many anomalies in the history of American colonialism in the Micronesian islands leading up to his lauded Compact relationship. But it is probably to his benefit to refresh his memory on why even some notable Americans like former US Ambassador to the UN, HE Donald McHenry, called the current Compact relationship "the culmination of A TRUST BETRAYED." It is in fact sad and insulting for Ambassador Reily or any other official American dealing with the Micronesian people to call the Compact relationships "the best there can ever be" considering the "Long and Winding Road" history of US colonialism in Micronesia and the current JEMCO micro-management of the current Amended Compact, all of which confirm such views like Ambassador McHenry or that of the former Press Officer to the Micronesian Compact Negotiation Committee, Paul Frederick Kluge, who, in his "The Edge of Paradise," considered the Compact Relationship "some kind of an indefinite postponement of the American obligation to develop the Micronesian islands to a real economic sustainable level." Ambassador Reily does not really need to remind people that one of the foundations of the Compact Relationship is the American need to control the Micronesian Archipelago for military purposes. We understand that since the 1948 formative meetings of the United Nations in San Francisco, where US military strategists insisted that the Micronesian islands be labelled as a "strategic trust territory' to enable the Administering Americans utilize the islands for military uses, despite the fact that the US did not fight bloody wars in all of the Micronesian islands except for Peleliu, Kwajelein and Saipan and found Tinian an ideal bombers base from which to bomb Japanese cities. (In the case of Chuuk, according to the available history of Operation Hailstorm, the American fleet was simply hovering 100 miles outside the Chuuk Lagoon, between the Halls Islands and Nama island to receive much damage other than 36 planes shot down over the Lagoon to the Japanese 284 planes and 4o some ships destroyed). If Ambassador Riley and anybody should really know, the Compact privilege to enter and live in the US is not really something to be proud of and used in a public campaign against the Chuuk Independence Movement because, for one thing, it is part of the failure of the Administering American Government's original obligations to develop the islands to a sustainable level as Mr Kluge and Ambassador McHenry observed. A more sinister reason is that the privilege is in fact the implementation of the controversial Americans' "Solomon Report" and "Nathan and Associates" reports of the 1960s, both of which reports recommended that "to achieve American strategic interests in Micronesia, the US would have to destroy Micronesian societies and cultures, move the islanders to the urban centers or to the US, to make them permanently dependent on American assistance, and secured permanent American strategic control over the region." Confirmation of the two reports' awful recommendation came during Compact negotiations were underway and some of the American negotiators were rather sympathetic to the Micronesians' unwillingness to agree to part from their islands to allow US military uses of the islands. That infuriated Ambassador Riley's former boss then at State, Dr. Henry Kissinger, (himself a descendant of Jewish refugees from Nazi Germany), who reportedly exploded: "There are only 90,000 Micronesians out there, who gives a damn!" We would like to believe that Ambassador Riley would give a little damn about the sovereignty of the islanders than his former State Department boss, We already gave Ambassador Riley's Deputy Chief of Mission and the Hawaii State senator, Mr Kalani English, who also interviewed members of the Chuuk Political Status Commission, assurances that the Chuuk Independence Movement is simply an attempted remedy for the inadequacies and inequities under the FSM constitutional federation and is equally based on Benjamin Franklyn's "self evident truths...one of which is that all people are ordained with certain inalienable rights...to life, liberty and the pursuit of happiness." We definitely ask Ambassador Riley not to use the authority and prestige of his Government to undermine the Chuukese people's sovereign right to provide for their perpetual survival as a people.